I thought this photo would be most fitting for the end of the year, versus another shot of the television screen showing the countdown. My mother, her boyfriend Trev, and the girls and I drove down to Texas from Oklahoma today. We’re going to be staying with my grandparents for a few days. We stopped in a hotel for the night along the way, eating take-out and watching the Times Square New Year’s Eve coverage. But this photo of endless road going over a hill is going to be my last 365 photo, because it’s not really over. There’s still road up ahead, still a LOT of photos to be taken of my very blessed life. Miss C took this picture of me today at the National Route 66 Museum in Elk City. I handed her my camera and held my breath as she lifted the heavy, bulky thing with her thin, lanky arms and barked out directions from behind it. She’s been telling me lately that she really wants to be a photographer when she grows up. Part of me wonders if that is just a “monkey see, monkey do” sort of thing, her just wanting to do what she see me do all the time. Another part of me wonders if maybe the bug has bitten her, too, if she really does enjoy capturing the things she sees through photos, creating images that will last longer than memory. Yet another part of me wonders if something in her DNA is whispering to her that photography is part of her make-up. After all, her grandfather is a photographer. Her mother is a photographer, as is her aunt. Can having “an eye” be as much of an inherited trait as brown hair and stature? Whatever it is, I’m glad I have a photography buddy in my home. I have one more photo to post for this year. And then it’ll be over. My resolution to capture an image a day will be complete. Over the past 365, I’ve altered that resolution somewhat. I should have clarified that I would capture and share A MEMORY a day, since I’ve also shared video or photos from the past. But it’s always been something relevant to that date, something I did or thought about on that day. I’ve enjoyed and appreciated the reflection. And I hope you’ve enjoyed it, too. You can’t visit the South without stopping at Sonic, right? As my mother likes to say, you only need a population of three in a southern town for there to be a Sonic: a manager, a cook and a waiter/runner to bring out the food. I snapped this picture as Miss C and my mother put in a order. 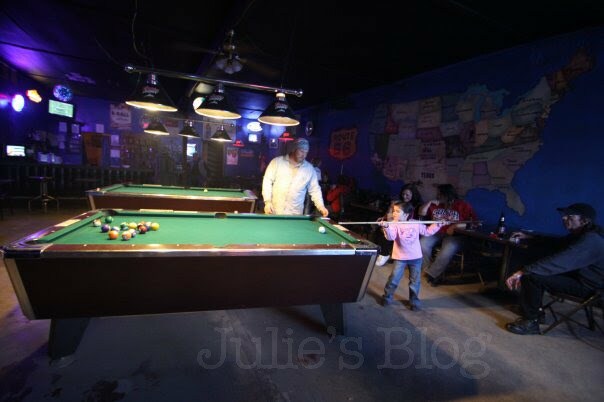 My mother lives in a small town along the famous Route 66, which is why the bar in town sports a giant mural of the United States and the route on one of its walls. Travelers on the Route often stop in to get a picture of it, so we did, too. With an order of ginger ale on the rocks, Miss C really took to the place. Maybe it was the regulars with their warm smiles and trucking hats. Maybe it was the giant motorcycle or two parked out front. Maybe it was the jukebox playing country/western classics, or the bright neon signs. I think, though, it was the pool table. Miss C was a quick learner and took it very seriously. So cute! Lola just adored Trev’s son, Talyn. Can’t you tell? Talyn and his sister Noley came over to open Christmas presents with us and eat dinner. The girls and I are in western Oklahoma, visiting their grandma Nona. We flew in last night. Martin’s managing the zoo back at the house. One can see for miles and miles and miles … it is SO flat here. Some snow and lots of ice, though. Figures we’d bring the East Coast temps with us. One of the first things we did was go into town and pull over to see this claim to fame: Miss C got to visit her billboard. Yup, she’s on a billboard. Her Christmas photo from a few years ago was used to advertise the city’s Christmas celebration. She said seeing it made her feel like Hannah Montana. This is what the girls saw when they woke up Christmas morning. Santa treated us well this Christmas. The girls were up around 7 a.m. and they were so excited to see that he put a bunch of presents under the Christmas tree in our family room. For the first time — and probably the last — I was able to dress the girls in matching pajamas. It’s hard to find matching outfits for one- and six-year-olds, so when I found these green jammies, I snatched them up.They looked so adorable together. And Miss C was so proud to be able to introduce Lola (who was just a newborn last year) to the fun of opening Christmas gifts this year. There was a lot to see before opening our gifts. Santa left some snowy/sooty footprints next to the fireplace. He also ate all of the cinnamon rolls we left him, and even found the time to write a personalized note for the girls. Miss C was very excited about that, especially since she was able to read it all by herself this year. Santa left some very sweet gifts for the girls. They got puzzles, coloring books and clothes. Miss C got her much-anticipated pink Snuggie, while Martin and I both got a blue and leopard-print Snuggie, respectively. But the best gift … the absolute best Christmas gift ever for our family … arrived a little later in the day. We are so happy to introduce Patches!! She’s a 3-year-old beagle rescue who needed a forever home. A family friend of ours was her foster mom and told us about Patches’ sweet personality. So we invited Patches over to our house about a week ago, under the guise of ‘pet-sitting’ for our friend, to see how she’d fit in with our family. We immediately fell in love with her, so on Christmas morning, our friend brought over Patches with a big red bow. She’s still a little nervous as she figures out her place in the family, but I couldn’t help but smile when one of the first thing Patches did was flop herself on top of Martin as he lounged on the couch. So sweet! Are these not the most delicious cinnamon rolls you’ve ever seen in your entire life? This is the second time we’ve had them. The first time was last year, Christmas Eve 2008, our first Christmas in our new house. There was a knock on the door, and it was Bob, our neighbor from across the street. He handed over a tree-shaped baking pan and explained that he and his wife Marlene bake these rolls from scratch every year for all the neighbors on our block. So on Christmas morning, we heated them up and indulged in the gooiest, heaviest, sweetest, most yummiest cinnamon rolls ever. Seriously. I ate three in one sitting. Then we waited a whole year and just this morning, there was that knock on the door and it was Bob with a tree-shaped baking pan, again. We are so excited and can’t wait until the morning so we can enjoy this wonderful treat once again. Miss C took this photo of our Christmas stockings. Martin’s go the fuzzy one, although none of us have individual ones, really. Whichever has the best loot, right? ?